Reher-Morrison has taken our 39 years of induction system design experience and developed LS3-LS7 heads that out perform the rest. We don’t believe in a “one size fits all” CNC cylinder head. Reher-Morrison has developed different port designs tailored to specific engine combinations to give you more power through out the usable RPM range. We have LS3 intake ports ranging in size from 263cc to 280cc not to mention a wide variety of LS7 ports as well. Just because it says “CNC” does not mean it will perform at the highest level and the GM LS7 heads are a prime example. GMs LS7 heads are already CNC’d from the factory, yet after they have been CNC’d with the Reher Morrison ports the heads pick up 40-50hp! Don’t get stuck with an under performing cylinder head. Reher-Morrison has also developed packages to complement your CNC’d cylinder heads. These packages produce 50hp to 100hp gains in the LS3 engines and 80 to 150hp in the LS7 engines. All our cylinder heads are “purpose built” to assure you reliability, proper valve train stability and maximum performance. Call Reher-Morrison and get the right cylinder head for your LS engine! 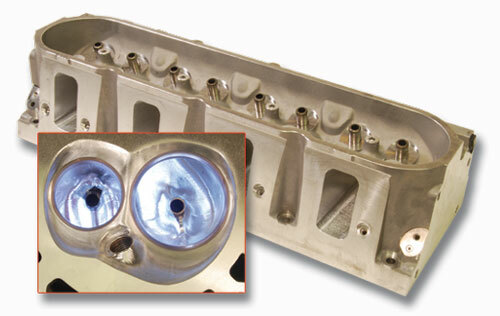 CNC porting your current LS3 or LS7 cylinder heads Only! $1000 pr. Not all programs are listed above. Custom port development available. Call for details.